Joanna Budelman (Chillibreeze) Interviews Todd Orwig (The Spur Group) to get an inside look at how a consulting firm benefits from a strategic graphics partner located half way across the world. Joanna Budelman: Thank you Todd. Both for this interview and for being such a great customer! We know The Spur Group is growing and Chillibreeze has been growing right along with you. In 2014 we started with supporting 8 Spur consultants sending 20 decks a month. Today Chillibreeze has served 71 from your team and we process about 95 decks a month. Chillibreeze is on schedule with our expansion plans of doubling in size by 2016. We now have the capacity to process 1,300 slides per day. On top of that we have launched a creative services department producing some amazing motion graphics for consulting firms like yours. So…here’s to a great win-win relationship in the days to come! Todd Orwig: Thank you Joanna. Definitely excited to know that! Joanna: When The Spur Group started in 2004, did you always have a graphics team supporting you for presentations? Todd: Majority of our existence we have had graphic support; I’ll call them strategic partners. We have gone through several different firms. We had one strategic partner and they were great. But the nature of how we sent them unexpected work didn’t work well for them. We then went to another graphics firm; they were also great. We burnt them out because we were always last minute. We have always had a local strategic partner. And then we’ve had additional capacity through one off vendors who don’t have a lot of capacity but could be filled in when needed. Joanna: So, your biggest pain point as a consulting firm was not being able to send last minute, rushed and unscheduled graphics requests and get it executed for the following morning? Todd: Yes, that’s correct. We largely were able to do it but it quickly became unsustainable with the majority of our work being sent at the end of our day and needing it back the next morning…that demand just didn’t work for our local partners. Then entered Chillibreeze, in July 2014. The time zone difference between Seattle and Shillong [India] proved to be a big win solution to our demanding graphics needs. We still use local partners, but it is for day work here. 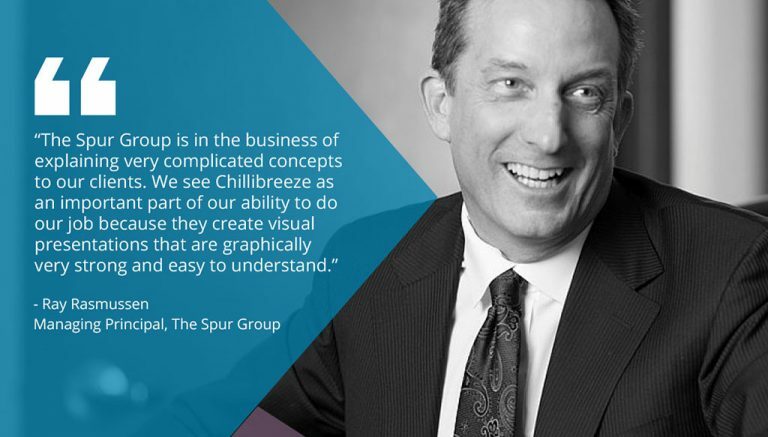 Joanna: How has Chillibreeze helped The Spur Group overcome their PowerPoint graphic support problem? Todd: I think it’s been 3 things principally and they don’t go in this order necessarily. One way you helped us is with capacity. Prior to Chillibreeze we had principally one graphics firm we did work with. We needed more capacity. Second, Chillibreeze has helped us in a significant way around the ability to be available while we’re sleeping. Third, we were paying a premium for after-hours work and Chillibreeze being in a different time zone allows us to avoid having some of those premium costs incurred for those last minute jobs. The time difference has been the biggest advantage but there is also the economic benefit with Chillibreeze pricing. 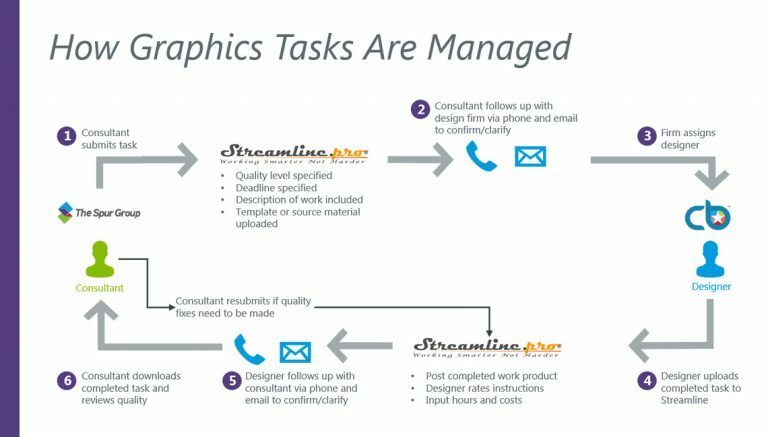 Joanna: Given the process oriented approach in everything you do, how did you zero in on Chillibreeze as your strategic graphics partner? In fact, there were some questions that we needed to include in the RFP process so we could exclude applicants that couldn’t meet those compulsory items. Joanna: That’s interesting. Can you tell us more on the processes you have with Chillibreeze? What makes this relationship such a win-win? 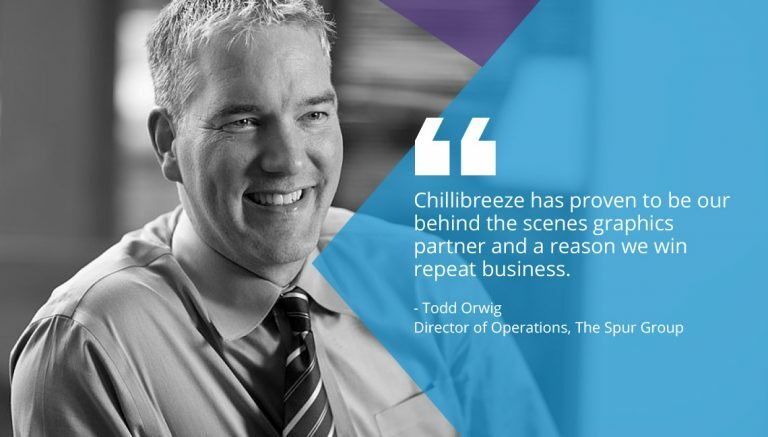 Todd: As we evolved with Chillibreeze we knew there were going to be some net benefits like what I mentioned earlier. Things related to time zone and the ability to get presentations done while we were sleeping. However, our 12.5 hour time zone difference also posed a huge communication challenge. So, we continued to come up with creative ways, through skype, cell phone, and through other means to minimize that time difference. In some cases, to be honest 12.5 hours can be a mere impossibility to connect people. Our people have been open to being available in the evening. Your folks have been willing to call. Then there’s the monthly meetings we have to address operational or communication issues between Chillbreeze and The Spur Group. Whenever I’ve sent an email with an issue, you and your team are very responsive. If there is a screw up, you and your team own up to it. I have never had the sense that Chillibreeze was reticent to ask a question, almost maybe to a fault. But they are erring on the side of “we want to do this right” if we have any questions we’re going to ask. That’s good training on your part, or good instincts on theirs, but either way, we love it. Last thing… The willingness to make it right. When we have had a deck that wasn’t right, you have been quick to make it right and not charge us for what was done wrong. Joanna: Let me add that I know your team has gone out of their way to answer our questions and take those evening calls to clarify things. Not just clarify, but spend time investing in us. For example, communicating nuances around a client style guide. Such time has made a big impact in the outcome of our work, because we are going to be formatting decks for that same client account with you for years to come. Security and confidentiality is so important in your consulting work. What was it that made you choose Chillibreeze? Todd: I think it’s 3 things. In this digital age of conference calls and skype, it made a huge impact on Ray and I when you were literally sitting at the table with us in our Seattle office, especially since you are a firm located in India. We had other options that we considered. We had started to partner with a company that was in many different time zones and could support us. We did all our meetings via skype, and it never worked, it was missing that trust. When we met you, being from the actual company in India, it made an impression on us. Secondly, you were already doing work with some of our clients at Microsoft therefore there was some credibility there. The fact that Chillibreeze was good enough to be an approved supplier for a place like Microsoft that cherishes confidentiality, certainly helped in building our confidence in you. Thirdly, Ray Rasmussen, our CEO, could tell right in that first meeting that you were an operations person. He could tell there was clear structure and operations behind the scene. It came through in how you described the work and spoke about the team. We don’t believe great thinking presented poorly is a good idea. Chillibreeze solves that problem by making us look good through visual presentations. Joanna: How else has Chillibreeze impressed you? Todd: The values part is a huge piece. You’ve seen our values poster When people come in for an interview they comment that they can actually see our values. They say “Those words are real; I can see your company through those words”. For us, what was apparent from our conversation with you was that it seemed like there was a similar value structure and culture that Chillibreeze had created in your training processes. Who you hired, how you incorporated the local culture etc. It showed that you understood you were making an impact on the region that you’re doing work, and that the people who are doing the work there mean a great deal to you. Their families are important and it was evident in how you described your team. Through interactions we’ve had with your team it seems that there’s a real familial aspect. Hopefully you’ve gleaned the same understanding about us. We spend more time with the people we work with than we do our families. That’s not because we work 80 hours a week, it’s just mathematically so. Our waking hours are spent more at work than with our families. Joanna: I resonate with your story about The Spur Group’s values poster. We too have our mission statement, values and foundational principles visible. We have similar stories of people coming in for interviews and being exposed to the principal of candor for the first time. Joanna: Any success stories that you would like to mention? Todd: Such stories happen daily. Typically, on jobs that are Bill of Materials (BoM) work where we may complete 18 deliverables in a 6-week time period. Every day matters in terms of progress against these deliverables. This is when Chillibreeze has proven over and over again as a capable behind the scenes graphics partner and a reason we have won repeat business. We keep expanding our BoM work because our clients see the results we showcase. In our consulting work, it is not all about the final material, it is about the journey. As part of the journey, we need to show measurable progress every single day and Chillibreeze is the backbone to that capability. We couldn’t do it ourselves when we’re managing 7 or 8 equally important projects simultaneously. It’s nice to be able to ‘throw things over the wall’, still be working and knowing that some other people are working as well. So that, the next morning, even if it is a slide or two, our client can go, “wow… You’ve actually moved this a mile from the meeting we had yesterday afternoon.” I can tell you that this story plays out every single day. Our customers think we are magical, and we are always quick to explain that we have a strong team behind us that gets us there. Joanna: Is Chillibreeze a ‘household’ name around your office? Todd: Tactically speaking your name comes up every single day, “Oh, just send it to Chillibreeze.” You’re a known and reliable entity. There are specific people, like Dylan Bodet. Every time I talk to Dylan about Chillibreeze he says, “oh, I love Jeneson. He’s great.” I feel like he feels a kinship with some of the folks on your team. I think it’s because you’ve come to his rescue. He relies on you and he’s appreciative of that. We have a lot of people singing your praises because often times Chillibreeze comes up with creative ways to solve and visualize a very complicated matter in a way that makes a big difference to us and to the clients we serve. Are you a mid-size consulting firm in need of graphic support for your presentations?